Rackspace Review 2019: Is Rackspace a Good Hosting? Rackspace has been providing enterprise level hosting since 1999. Aside from a poor live chat experience, this is a managed hosting solution offering everything you need (and more) for a bespoke and premium service. Rackspace has been providing managed cloud services since 1999. It has some impressive statistics with customers in 120 countries, including two-thirds of the FORTUNE® 100 using its services. The modern website is available in English, as is its support. Rackspace’s infrastructure is exceptional. There are data centers located in multiple locations around the world (Chicago, U.S., Dallas, U.S., London, U.K., Frankfurt, Germany, Hong Kong, and Sydney, Australia) as well as eleven “Mega Port Connections” around the world. In fact, it’s so confident in it’s network, there’s a 100% network uptime guarantee and infrastructure guarantees. The company is operated by an army of experts, with more than 3,000 dedicated hosting engineers, one billion openstack managed server hours (with 99.99% API uptime), and 1,000 AWS technical certificates. In terms of the services, there’s managed hosting, managed cloud hosting, co-location, and tailor-made dedicated servers, to name a few. With the managed plans, the technicians will deal with all of the technical tasks such as configuring and managing MySQL and Microsoft SQL Servers, as well optimizing the performance and troubleshooting. The plans include various performance-enhancing features and tools for optimizing page load speed and smoothing hosting scalability. You’ll have load balanced servers, so you don’t need to worry about spikes in traffic, and robust Juniper and Cisco network equipment. Your servers will be monitored 24/7 with DDoS and threat protection. The prices are not displayed on the website, however, that’s quite common for tailormade plans. It’s a premium, fully managed service, used by top companies, so you should expect a high price. There’s no money-back guarantee or free trial, however, again, this is quite normal. The plans are tailored to your specifications, so it’s understandable that you can’t try before your buy. If you need customer service, there are a lot of ways you can get support. If you’re the kind of person who likes to research solutions on your own, there’s support documentation, API documentation, community forums, and how-to articles, so you’re well catered to. When you need to speak with somebody, there’s 24/7 customer service by phone and email to various departments (Legacy Datapipe, OpenStack Cloud, AWS, and dedicated hosting), as well as live chat. 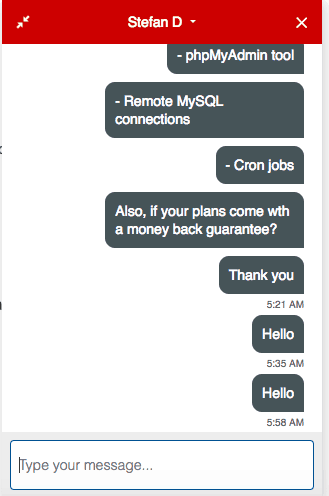 While I find it hard to fault this company, the only downside I found was the live chat support. I contacted them by live chat at 7:00 a.m. GMT, the operator picked up straight away, however, as soon as I’d asked my question, he stopped responding. After waiting around 30 minutes (you can see from the timestamp), I asked them to send me an email, which they did not. Rackspace is an enterprise-level managed hosting company that has been in business since 1999. With more than 2,500 customers in the healthcare industry alone, this company has a significant customer base. If you’re in the market for premium, managed hosting, aside from the live chat experience, I am impressed with this company. Wondering how Rackspace stacks up against other Web Hosting companies? Enter any other Web Hosting company and we will give you a side-by-side comparison.